We had such a wonderful time in Panama City Beach...once we found out the areas to completely AVOID due to the massive amount of spring breakers that were running around! It was like fifty bazillion teeny boppers rented scooters and took over the town! CRAZY! Let me tell you!! But, we found our paradise and solitude in our park at the Emerald Coast RV Resort...it couldn't have been more perfect. What a lovely spot! The girls loved every single minute of it...can't you tell?? Of course, it certainly helped that we had a grill on the site and if the girls sat in our chairs...they were just about level with the food that was cooking!! Jeanne, I spent many vacations at Panama City Beach - my Grandmother lived there for 10 years in a lovely condo on the water - the beaches are amazing, aren't they? What a nice campground! Brick pad! WOW! ... and I love your umbrella :-) Your new blog look is awesome! I wouldn't have to sit in chair to be level with what you're cookin'! What a gorgeous collage. The weather there looks absolutely incredible. It sounds like you girls are having the time of your lives! Oh, we see blue skies and sun, something missing around here most of the week. It looks quite pretty and relaxing there. Enjoy. Wow, what a beautiful place! Great photos!! "It was like fifty bazillion teeny boppers rented scooters and took over the town! CRAZY! Let me tell you!!" HA! Yes, I know EXACTLY what you mean, Jeanne, because when I still lived in Florida, Spring Break was just horrendous. Nothing but loud teeny boppers all over the place! Gorgeous photo collage! That resort looked beautiful! Have a great rest of your week, my friend. And welcome home! Looks like a pawsome time! I have a friend who vacations there multiple times a year with his family. Looks beautiful! 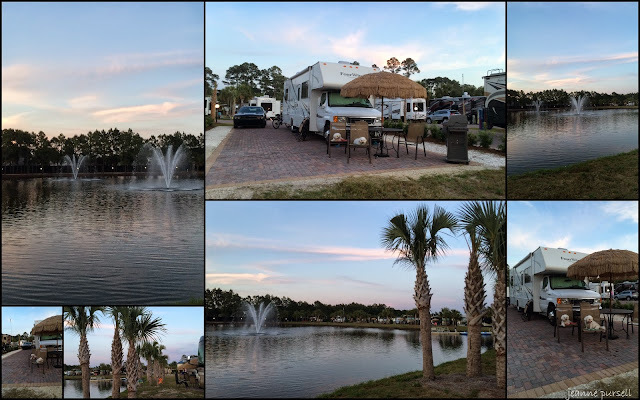 Wow...palm trees, lakefront, K9 company...it doesn't get much better than this! Enjoy! That looks like a lovely place to stay. Too bad about the spring breakers though.